Flor De Sal Sea Salt for sale. Buy online at Zingerman's Mail Order. Gourmet Gifts. Food Gifts. The flower of salt in a jar meant to last. Years ago we imported fabulous jars of fleur de sel, the famed French sea salt. The salt was great and everyone coveted the jars. They had thick, blue-tinged glass and a wide opening topped with a giant cork—easy to pop off with one hand and grab a big pinch of salt for cooking. I still have one on my counter and I know I'm not alone. For ten years I've filled it with whatever sea salt I'm using at the moment. It's been years since the jars were available in France. I feared they were lost forever. During a trip to Portugal I discovered they'd migrated south. Portuguese flor de sal makers were using them—now we're importing them. 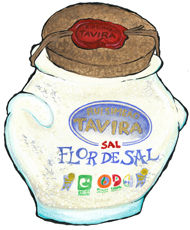 Flor de sal, or "Flower of Salt," is made in the same style as French fleur de sel, just a few hundred miles south in the southern region of Portugal called the Algarve. The salt is gathered by hand rakes when it floats to the surface of shallow salt-pan pools. If that description sounds like a savory version of Willy Wonka's Oompa Loompas making candy from the Chocolate River, your mind is in the right place. It's a magical process, one that makes a magical kind of salt. Flor de Sal is renowned for its texture and flavor. On the tongue it feels like tiny snowflakes. The flavor is soft and delicate, much different than other sea salts. Some folks claim they can even detect a fleeting aroma of violets. As with great olive oil, you want to use flor de sal when it can show its best features. That's usually at the end of cooking when its snowflake texture is better preserved. Use it to finish dishes like spring asparagus, summer tomatoes or fall potatoes. Or keep this bowl tableside for sprinkling during dinner. Its flavor will beat the contents of a standard salt shaker any day. And you'll never throw away the jar.